Because one should never drink on an empty stomach. I love the idea of making a quick snack to complement your pre (or post) dinner drink. Kind of like a wine pairing, but a little less complicated. It’s great for entertaining, or if you’re having people over for a quick drink before heading to dinner. I figured “snacktails” was an appropriate word fusion… better than cocksnacks which could mean something entirely different. The idea is that the snack be very simple and quick, especially if you’re making an involved cocktail. If the snack is super involved, I’m probably having it with wine. This week, however, the cocktail is as simple as the snack. The “Lazy Laura” is pretty much our house cocktail. At least it is if you’re at my house, up for anything and I’m the one mixing. This whole craft cocktail thing got me really into peachy Manhattans, but at home, I’m a pretty lazy mixologist. I don’t always want to fuss with a shaker. So I just put peach bitters into the whiskey to snazz it up. Is it the same? No. Is it close enough? Yep. For the snack to go with it, I simply took flavors that go well with peach (browned butter and nutmeg) and tossed it with some cashews. Done and done. You can garnish if you want to. Clearly, I did not. In a small skillet over medium heat, melt the butter and continue to cook until it's a chestnut brown. Be careful not to burn it. 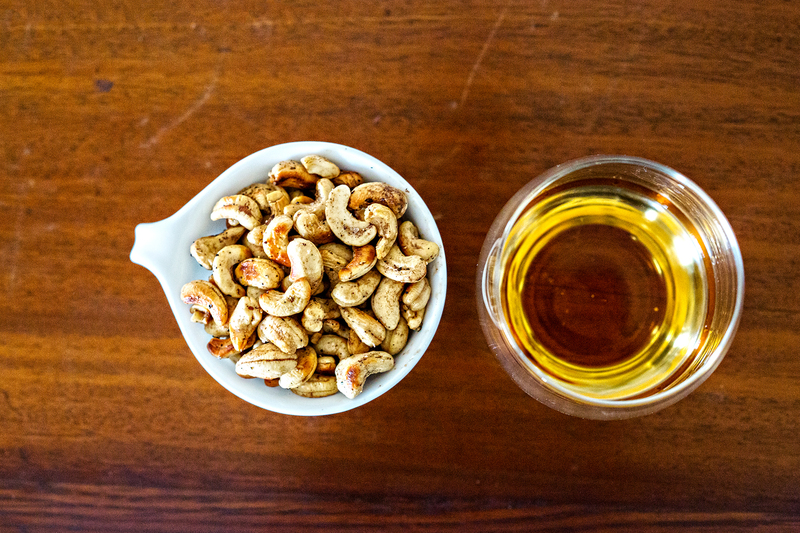 Toss the cashews, salt, and nutmeg in the pan and stir, continually flipping and moving around until the cashews are roasted and starting to turn golden. Remove from heat and serve warm or room temperature. Pour the whiskey over ice and add the bitters. Garnish with a peach slice, if desired. If you have a lighter you can kind of burn (I mean... caramelize) part of the peach if you want to.